Bird species that pass through Northeast Ohio during migration or live here in spring and summer, are also found on Central and South American forested coffee plantations in the winter. Some, like the enchanting, tree-top loving Cerulean Warbler, are declining. One important reason is the habitat they depend on in Latin America is degrading or disappearing, much of it for agricultural use. 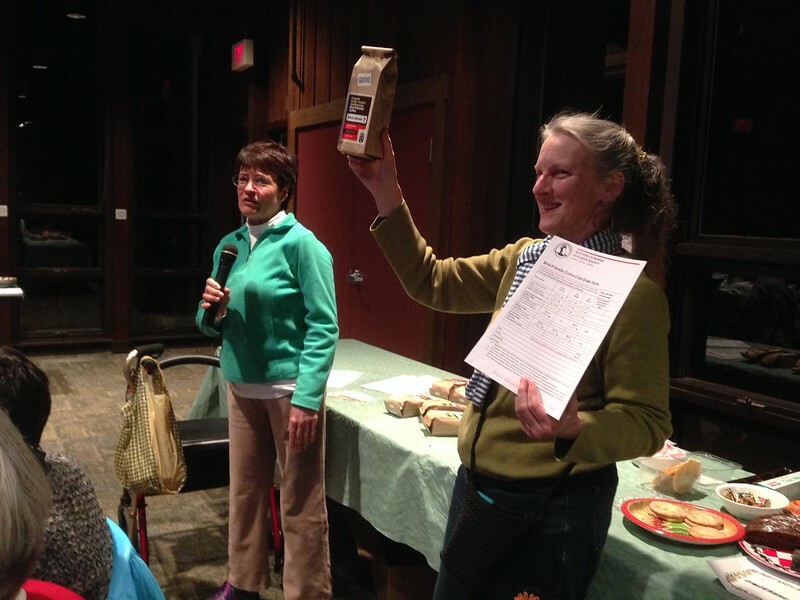 Above: Suzanne Aldrich, Bird Friendly Coffee Coordinator (left) and Betsey Merkel, Web & Marketing (right). Not only is your chapter or organization receiving a percentage of chapter annual sales to support conservation activities, but promoting consumption of organic, Smithsonian Bird Migratory Center certified shade-grown coffee is a great way to connect to people who care about birds and conservation who might not be members. Photo: Courtesy of Birds and Beans Coffee. Every day is an opportunity to preserve bird habitat, whether you are out on the trail or standing in your kitchen sipping a newly brewed cup of coffee. Birds and Beans links conservation and coffee together by providing Western Cuyahoga Audubon Society an annual rebate of 5% annual sales volume to put towards Ohio’s conservation projects. Scarlet Tanager (Piranga olivacea) at Cleveland Lakefront Nature Preserve, 8701 Lakeshore Blvd, Cleveland, OH 44108 by Laura Gooch. During the winter, the Scarlet Tanager lives in mature forests and forest edges and often visit shade coffee plantations in the Andes, Mexico, and Central America during migration. They are hard to see because they like to hide among the wide leaves of deciduous trees in the forest canopy. They feed mainly on insects along with some fruit and tender buds and joins mixed species foraging flocks with flycatchers, antbirds, woodcreepers, and resident tropical tanagers. Ordering is easy! Click here. FACT: Songbirds that migrate to Mexico and the tropics are on the decline. TRUE: According to the North American Breeding Bird Survey, the population of chestnut-sided warblers has declined by 4% between 1966 and 2015. FACT: Coffee plantations use various farming methods, such as full-sun to agroforestry systems, to grow and harvest coffee beans. TRUE: According to a paper published on the "Biodiversity Conservation in Traditional Coffee Systems of Mexico" in 1999, Coffee is grown under a continuum of conditions, from rustic or traditional, to full sun, and these “shades of shade” are not equal when it comes to the health of ecosystems (Reference: Biodiversity Conservation in Traditional Coffee Systems of Mexico. 1999. Conservation Biology 13:11–21.). How do you know that every single bean in every single bag is shade-grown? Buy Birds and Beans coffee! FACT: Coffee label lingo (Fair Trade, Rainforest Alliance, Shade-grown, Organic) can confuse consumers in the grocery aisle. FACT: Specialty coffee costs more than well-marketed coffee brands. TRUE: The Whole Foods grocery store in Rocky River, Ohio, sells only one blend of organic, bird-friendly coffee, named Early Bird Blend. One 12-oz bag sells for $11.99 (ground). Birds and Beans coffee comes in many blends, grinds, and sizes. One 12-oz bag without shipping and handling sells for $9.25. With shipping/handling shared among other coffee drinkers, WCAS sells it for $11.75 a bag. Buying a bag larger than 12 oz every other month yields even more savings to you. Learn more about joining the WCAS Bird Friendly Coffee Club here. REMINDER: 5% of annual chapter sales support local conservation projects. USGS Patuxent Wildlife Research Center. 2015. North American Breeding Bird Survey 1966–2015 Analysis.